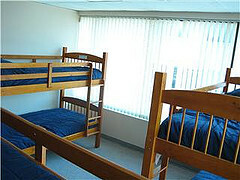 May 1st to October 31st: $24 per night, $150 per week.---November 1st to April 31st: $24 per night, $140 per week, $500 per month. 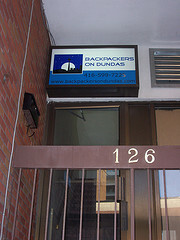 Backpackers on Dundas is conveniently located in the heart of Toronto, at Dundas Street between Bay and University. 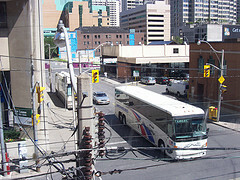 BOD is adjacent to the Toronto Bus Station. Simply take the Chestnut Street exit from the Arrivals level. You will be at the northwest corner of Chestnut and Dundas. BOD is located in the building on the southeast corner of that same intersection. The entrance to BOD is on the Chestnut Street side. 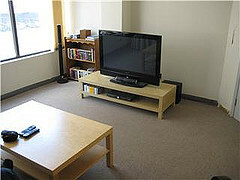 Take the University subway line to St. Patrick station. Go to University/Dundas traffic lights and turn right (you will be on Dundas). Walk to the next set of lights east of Dundas and turn right. You are now on Chestnut. The entrance to BOD will be on your right, clearly marked. Take the Bay Street exit walk north to Dundas. Turn left at Dundas; walk west until you reach Chestnut st. The Entrance is on Chestnut st., clearly marked. Take the 192 Kipling bus to Kipling subway station. Get on any subway train (they're all heading east). Get off of the train at St. George station and transfer inside the station to the southbound University line. Get off train at St. Patrick station. Take the Airport Express bus labeled Downtown. The bus will stop at the Metropolitan Hotel on Chestnut Street. Exit at this stop. Walk north on Chestnut toward Dundas. BOD is the last building on your left before you get to Dundas. The entrance faces Chestnut. 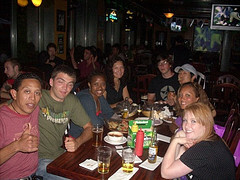 We thank you for booking your Toronto holiday accommodations with Backpackers on Dundas. Please note that you must have a valid passport and recent travel documentation or we will not be able to honour your reservation. we are across the street from the bus/coach terminal. 3 min walk to 2 major subway. the airport express bus is at our front door too.